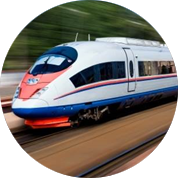 High-speed rail (HSR) passenger transportation systems have been, or are being, developed in dozens of countries around the world. Although the basic elements of the technology resemble conventional rail transport, there are numerous engineering design differences, including the subgrade, track system, motive power, rolling stock, traffic control, power distribution system, traffic control and station design. Recent plans for development of HSR in North America mean that engineers must understand these engineering elements, as well as the planning, economics, construction, operation, maintenance, management and other principles of HSR systems, in order to successfully develop them. CEE 412 is typically offered in the classroom or online every other spring semester.